We pray that you and your family will enjoy the Blessings of God this Christmas! Donna and I are planning to spend Dec. 31 with our friends in Saskatoon, SK. The services will be SUN 10:30 & 6:30. We will have a Baptismal Service at the close of the evening service. On Monday Jan. 1, 2018 there will be a special New Year Rally to TRANSFER (without charge) Christ the Healer Gospel Church, 136 Ave F S in Saskatoon to the TORO Ministries, under the leadership of Rev. Terry and Sherry Severson. 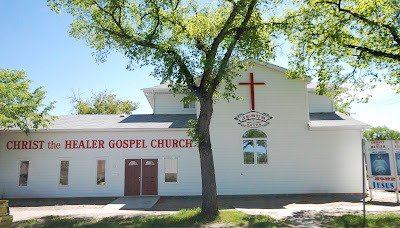 This will be the last time I will preach as the pastor of Christ the Healer Gospel Church in Saskatoon. On August 31, 2007, Solbrekken Evangelistic Association of Canada (established in 1963), purchased the property at 136 Ave F S from the River of Life Ministry. My wonderful wife Donna and I opened Christ the Healer Gospel Church with a 10 Day Fasting and Prayer Revival On September 26, 2007, we dedicated Christ the Healer Gospel Church to the Lord Jesus Christ for preaching of God's Word and practicing the Christian Faith in Saskatoon, SK . Several years later we undertook a major renovation, joining two buildings together with a new foyer and Front entrance. Donna worked untold hours, untiringly painting. Architect Dan Custer was a great help in the shaping of the New Addition, as was our son John Solbrekken who put in the electrical, plumbing and did the carpentry. God spoke to my Missionary heart to use our $120,000.00 Missions account to get started. He assured me that Riversdale area referred to as 'the Hood' was indeed a mission field. There were many expenses, including the installation of a new furnace. Friends from across Canada began to send small and large donations to help us. One day, a businessman from another province called to say that God had spoken to Him to visit me. He had some back tithes which he should give me. It was a surprise as I had not seen him for more than 20 years. God was blessing his business in a wonderful way. He wrote out a cheque for $50,000, and for a number of years he has continued supporting our Missionary Ministry with that same amount, allowing me to continue doing overseas Missions while pastoring in Saskatoon. For the past 4 years we have been praying that God would send us a Ministry to which we could confidently TRANSFER Christ the Healer Gospel Church. We are seeking our Lord for a major grassroots Revival, in order to change the spiritual complexion of Riversdale and Saskatoon. We know Terry and Shelly Severson, and have seen their ministry blossom into righteous living and a heart for the poor, lost and dying. He and his family have a strong desire to bring together people of all ages and races. They will reach out to the young and old and to little children and youth. His Ministry in Brazil went amazingly well and also was blessed in Assinaboine and Sturgis, SK. This will free me to pursue the Missionary work I have been involved in for more than 50 years, as well as publishing many very powerful books which I have written, as well as doing radio and television work. Donna and I, as well as a number of our National Directors will join us in officiating the legal transfer to TORRO Ministries on Monday January 1, 2018 at 2:30 PM. Please join us in praying God's blessing upon Terry and Shelly, their family and those who labour with them in the big task of bringing in the harvest for Christ and His Kingdom!